China may have overtaken the U.S. as the Saudi Arabia of wind power (got that? 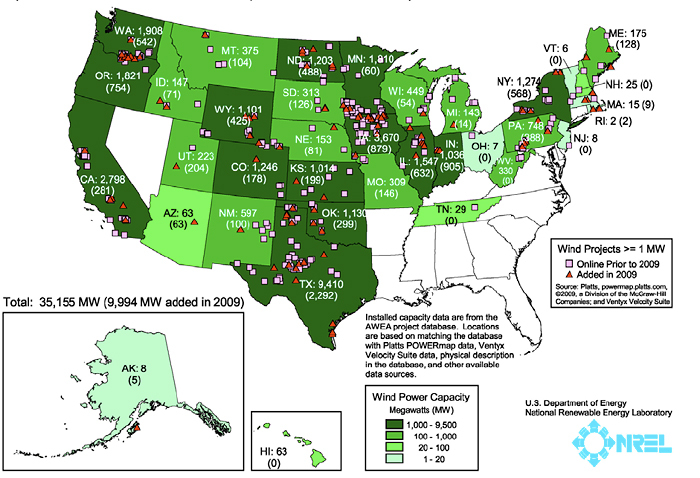 ), but the U.S. is still home to some major wind energy powerhouses. The annual Wind Technologies Market Report tells us that four states–Iowa, South Dakota, North Dakota, and Minnesota–managed to squeeze out over 10% of their in-state energy production from wind power last year. Iowa emerged out in front with 20% of all in-state production coming from wind energy–unsurprising for anyone who has been pummeled by wind in the Midwestern state. Even outside of those four states, the U.S. kept ahead of the wind power curve in 2009. Texas added 2,292 megawatts of new wind power capacity, and an impressive 28 states built new wind power plants. And while China added more wind energy overall, the U.S. still managed to import $4.2 billion worth of wind power equipment, up from $2.5 billion in 2006. As we mentioned previously, America still remains the cumulative wind power leader, with over 35,000 megawatts of total capacity (compared to China’s 25,832 megawatts). The future is not quite as promising. In the U.S., a combination of financial woes, low wholesale electricity prices, and low demand for renewable energy will likely cause installed wind power capacity to drop 20% to 45% in 2010. Capacity may pick up in the following few years, although the expiration of wind power-friendly federal policies in 2012 leaves the long-term forecast up in the air. But hey, we’ll always have Iowa.